"Dear Eli, I wondered if I could ask a question about John 8:11 "Go and sin no more." I have heard several messages and comments lately about how Christians needs to stop sinning based on John 8:11. It is often suggested that we can do this with "God's power." I'm confused as to why Jesus would say this to a crushed woman in need of the gospel rather than the lawyer of Luke 10. Of course sin is awful and a believer should daily become more aware of this, but the phrase presents a literal impossibility! Do you have any suggestions about why Jesus says the phrase, "Go and sin no more"?" Your question is a really good one that highlights the way Christians often draw out of a verse more than is warranted. The context of the story and the greater context of the Bible could never warrant the interpretation that Jesus strictly and literally meant: "From this point on, do not sin at all anymore." Not only is that Scripturally and experimentally impossible, but it would be patently absurd for Jesus to say such a thing to this woman at such a time. Even if one argued that he was trying to teach her the true standard of the law to show her her sinfulness (as He did with the rich young ruler), it would be bad timing and totally out of place. This woman was already conscious of her sin, and after such a terrifying experience it was not the time for Jesus to say: "Go and try to be perfect and you'll see that you can't be!" I understand this saying of Jesus to be, not a general command about all sin, but a specific prescription suited to her exact case: "You have just been wonderfully saved from a horrible situation. Your accusers, whom you thought were going to kill you, are gone and I don't condemn you either. Now go your way, but don't go back to your adultery. That is not right and good for you, and it is only fitting in view of the deliverance God has given you that you don't do that anymore." Thus I don't see Christ commanding her to stop all her sins from then on, but to not go back to the sin in question: adultery. Nor do I take it as a threat: "Go and sin no more or else I will condemn you." It is a command that is simply reasonable in light of the circumstances and which is for her own good. The matter of condemnation was behind her. "I do not condemn you." This is unqualified and does not depend upon her performance. The command to not go back to adultery is simply appropriate given the circumstances, and is for her good. Her experience parallels the Christian one. We, too, deserved death and only through Jesus Christ were we wonderfully saved and delivered from all punishment. Christ says to us, "Neither do I condemn you." We are freed from all condemnation, and this is unqualified and freely bestowed independent of our moral performance. We, too, then hear from God and His messengers, "Go and sin no more", not as a threat, as if condemnation still hung over our heads depending on what we do, but as the prescription of what is our appropriate response to God's salvation, as well as for our own good. We are not saved because we sin no more, but we are to go and sin no more because we are saved. In fact, it is because the order is not "Go and sin no more and I will not condemn you" but rather "Neither do I condemn you; go and sin no more" that there even exists the wondrous inspiration to go and sin no more. The opposite order does not have the inspiring power. Of course, I'm right now applying this command to all of our sins in general, which we obviously shouldn't do any longer, yet as mentioned before, I believe the original command in John 8:11 is specifically addressing the woman's adultery. So I am drawing a universal principle from a particular incident. Due to the fact that we walk by faith and are dull of understanding and slow at remembering, we will continue to sin in this life because we will continue to forget God's wondrous love and grace. However, I would bet that for that woman, she never forgot that wondrous day and never went back her adultery. So no, we don't need to stop sinning as if our salvation depended on it. We would greatly err if we took Jesus' command in that way. But in the light of God's salvation not sinning is the fitting response for us. This doesn't mean that we will stop sinning before we reach heaven, but we ought to acknowledge that it is the fitting response, and also that it is for our own good. 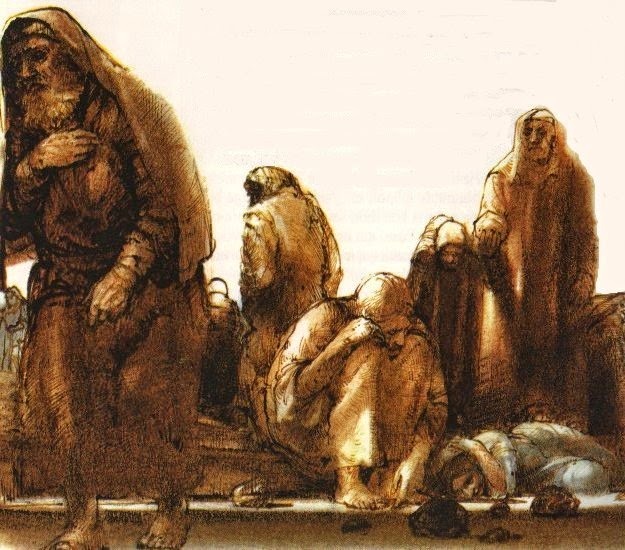 Annihilating the Canaanites: Was that Right?